I love to ride my mountain bike on the trails. 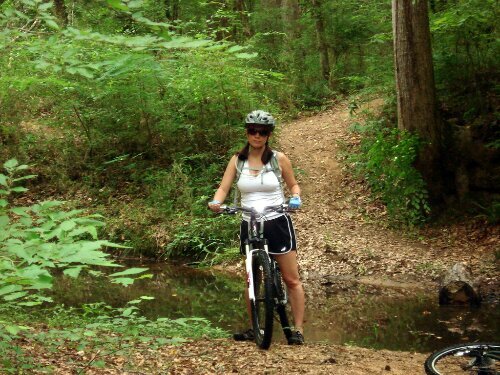 Most people would call this “mountain biking;” however, we don’t have mountains in thomson, Georgia. We’ve driven to the foothills to ride on the trails, but that’s still not the same as “mountain biking” like I know people enjoy in places like Colorado. It’s not scary or completely dangerous (unless you are a part of OUR family). 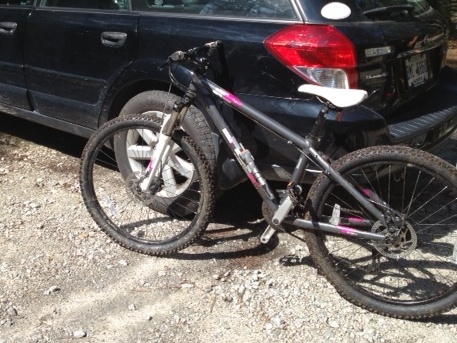 We had plans to ride a local section of the Bartram Trail with our friend, Bearded Mary. I was so excited last night that I didn’t get to sleep until around two am. I haven’t been “mountain biking” since September. On our last ride, we went with a few of my coworkers… one a passionate biker. We were riding at the Augusta Canal (read: completely flat flat flat). It was a gorgeous morning – perfect day for a ride. Bad things always happen on “perfect” days. Just saying. Not even five minutes into our incredibly flat ride on this beautifully gorgeous morning, Dirty Boy hit a wash out on the trail, lost his front tire (as in it came OFF the bike), and skidded long the trail. He lost a chunk of meat about the size of a half dollar from his arm, but he was calm enough to ride back to the car… after we replaced his tire. Want to see the wound? 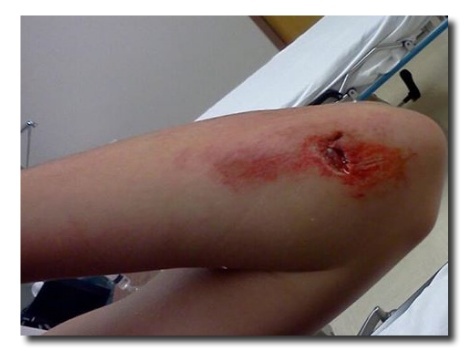 We spent three hours in the emergency room – in our chamois diaper bike shorts – while his arm was cleaned and stitched. Mr. 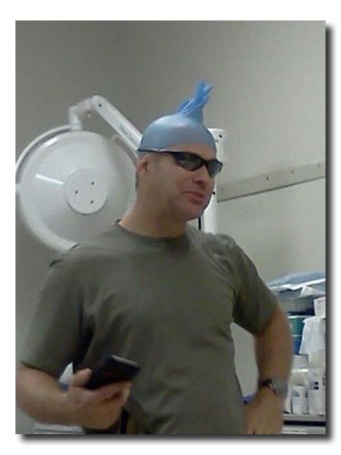 Dirty enjoyed hanging out in the emergency room a little too much. Dirty Boy made friends with the staff; he knew he would see them again sooner rather than later. Woo! I got way off track. Before I tell you about today’s ride, I have to tell you that the kid gets it honestly. 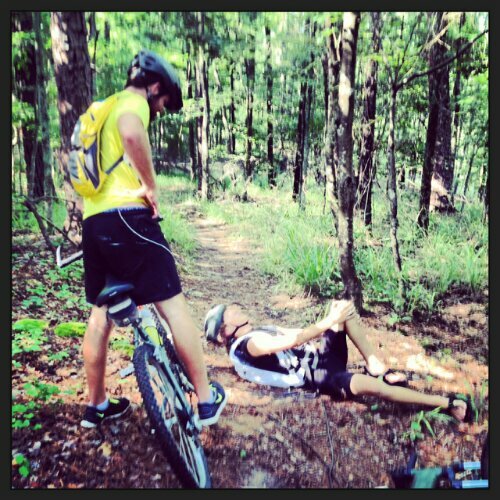 When we first started “mountain biking”, I crashed my bike & dislocated my shoulder. On that particular trip, it was just me and the boy. It was a painful ride back to the trailhead. I’ve had some rather spectacular crashes – one of which ripped my shorts from my body!! Thankfully, the Lovely Lisa was the only one around to experience THAT particular horror. Back to today. Our plan was to enter the Bartram Trail at Petersburgh Campground, ride a few miles, and turn around. This would be the first trail ride for Bearded Mary, and we didn’t want to over do it. Not to mention that I haven’t been mountain biking since September! The weather this morning was perfect for riding (dum dum dum dum). We’ve had some really crappy weather lately,unless you love constant rain. The only benefit I see is that a certain band dude we know will no longer complain about the water level at the lake (We like the band dude, really, we do) and MUDDY TRAILS. Muddy trails are the whole reason I love trail riding!! There is something totally cool about riding through a puddle on your bike. I grew up on a dirt road. We would take turns riding through the puddles. I love the feel of the mud flying up all over your legs. It’s priceless. This morning, there was spectacular amounts of mud on the trail. I was amused to watch Bearded Mary ride around the puddles. Who does that?! It’s probably not clear from the name, but Bearded Mary is not your typical Mary. He’s way too hairy to be typical. I had to explain that the objective was to get dirty. If you’re clean at the end, you did it wrong! That’s the view from Dirty Boy’s GoPro camera as he went down on a relatively flat (again with the flat) stretch of Trail. 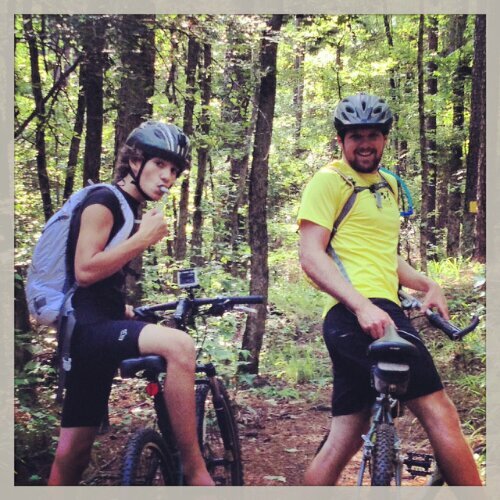 For the record: he is scary good when riding on the crazy steep trails… it’s the flat spots that trip him up. Actually, today it was a branch about as big around as my thumb; it stuck in his spoke and brought him down. He tweaked his knee pretty good – there was even blood shed. Luckily, my genius self brought a first aid kit. Could you imagine being dumb enough to leave that at home?! We did have to end our trip sooner than we planned, but that meant I got to go back through the same puddles!! Guess what I hear right now? More rain falling on my tin roof (yes, it’s really a tin roof)!! 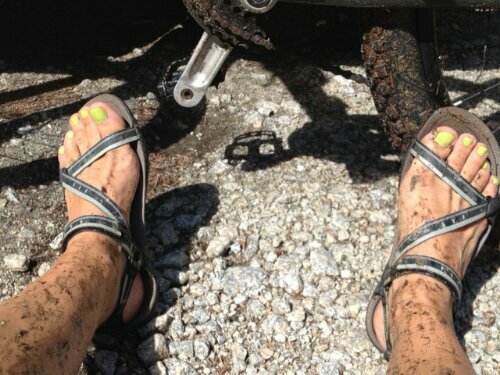 Looks like we will be back on the trail on Thursday to get even dirtier!